After work on Friday, we went to a member potluck at the HVCCA in honor of their new artist in residence, which was much more fun than I expected it to be. Some of the food was really good, and the conversation was really hearty and interesting. There was also a baby that I got to walk around with. I'm fond of adorable, angelic babies that don't cry, but merely grab your hands and walk around. She belonged to an adorable hipster couple who also happened to make really good risotto. The wife was from Minnesota, but looked like she was from Paris. We woke up late-ish on Saturday morning, and then went to Macy's to buy some earrings that were on a good sale. Roger called them my "I'm sorry I crashed your car" gift. The saleswoman was slower than we expected, so we didn't have time for breakfast, and ended up rushing him to work. I went to an absolutely amazing house to do an interview that afternoon, which was wonderful. I want to own an old home one day, though lord knows when I'll have enough money/a stable living-situation, so it was nice to visit one for the day. Rachel picked me up that evening to get Roger and eat dinner at Birdsall House, which was even better the second time around. Their ruben was just wonderful (as was the shrimp & grits - I ate half of Roger's), and we're really looking forward to the day when they open a biergarten next door. Today, of course, was Halloween. Since 2008, Halloween has sort of gone downhill. 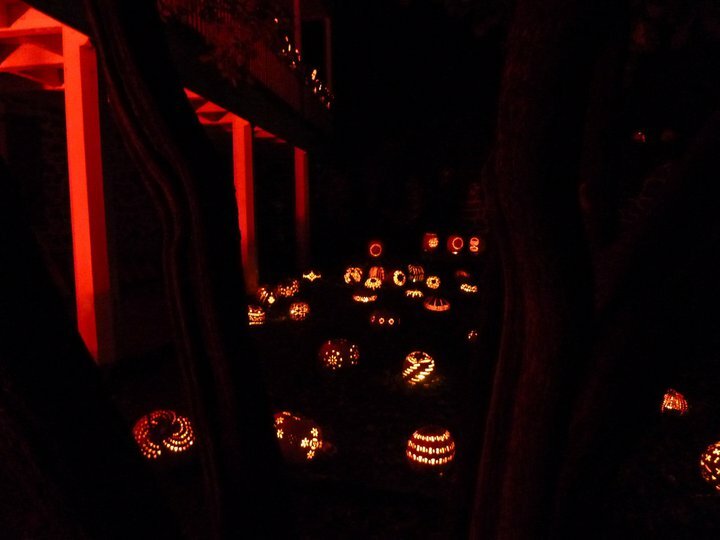 I'm not complaining; 2008's Halloween, when we threw "the best party at Sarah Lawrence. Ever." was fantastic, but I don't mind quiet evenings at home, either. Sure, a few more trick-or-treaters would be nice (my father's enormous light show has drawn about 12 tonight, and my parents have told me that's more than in the past three years combined), but I made some really good black bean & pumpkin soup at Allison's recommendation for dinner, and that seemed festive enough. Maybe Roger and I will watch a horror movie, and that will count. Otherwise, we've mostly been mulling over plans. I knitted some, and wrote an article. A good, vaguely productive day, and a nice (and delicious!) way to end the weekend. So, this little ritual is meant to be "silent," letting the image speak for itself, but since I haven't posted all week, I thought I'd do a quick update. I spent part of last weekend in Albany celebrating my best friend's birthday. Shelby's a wonderful person with a genuinely good heart, and we don't get to see each other enough, so it was great to celebrate with her, and especially to chat with her for about an hour before I left on Saturday morning. She seems to really be moving forward with her life, and I couldn't be happier for her. I also saw some of her friends from up there, all of whom I'm quite fond, and Rachel, who is studying psychology up there for a super-fancy hibachi at Koto (experience the magic), which was wonderful. Saturday was mostly playing catch-up (articles, poems, applications), and then a late evening with some of Roger's friends from college at the brewery and Cece's house. Yes, I fell asleep. At someone else's house. After brunch on Sunday, we celebrated another birthday, my mother's, with some really delicious Italian food at Little Sorrento, and the Great Jack O' Lantern Blaze, which was such a lot of fun. Finally, a harvest event! The week was hectic, of course, but also nice and filled with plans. Keeping on keeping on. I first read Harry Potter and the Sorcerer's Stone in 1999, right when Chamber of Secrets came out in the US. (I didn't realize until I just looked that up that it's been eleven years since I first read it. I feel a little old now.) It was the only time I would ever read two of the books in succession. After that, there would be a year wait (and later, multiple year wait) between books, as Harry grew up with me, the exact same age as me until the first major pause between books. I wouldn't say the books changed my life. I've been, since age five, a voracious reader, so they didn't turn me on to reading. By 1999, I'd already read (or had read to me) the Narnia books and Lord of the Rings, so they also didn't turn me on to fantasy. But they were good, and quick, and I loved them as much as everyone else. My only real problem with them has been that I read them all so quickly, and they were spaced so far apart, that I really don't remember anything about any of them, except for some key moments of the first one, most of which center around my wonder at the Hogwarts School of Witchcraft and Wizardry. I suspect most children sort of dream of going to a fancy British boarding school with mysterious stairways and portraits and candlelit dinners and classes in magic, and I was wholeheartedly one of them. While the films (and Christchurch) did reproduce the school about as how I'd imagined it, I'd read so many of the books and had the image so set in my head by the time they came out that nothing has ever really affected my vision of it. I love that, because it feels so rare with all the media we have immediate access to now. And I love Hogwarts because it's so terribly detailed and accurate to my childhood fantasies. Maybe even to some of my current fantasies, as well. Sorry to have been a bit absent last week, but between work-work picking up, trying to get my future life in order, writing more, and, oh yes, the incredible relaunch of Call & Response, I've been busy. So busy that after backing out of plans to attend a lecture of modern curating and bottle pumpkin beer on Friday, I fell asleep at approximately 9pm. Which was lovely, although possibly not quite as cool as learning about home-brewing. Saturday, Roger and I both backed out of plans to go to another lecture and a friend's play, an d did more of nothing (aka: me reading him every other line of The Commitment while he tried to apply for graduate school) before making pumpkin smoothies and boxed cake with Cece. I sort of feel bad about the lack of anything being accomplished this weekend, but let me just point out (to myself, for the umpteenth time) that I get really, really cranky when I don't sleep. And also, I accomplish a reasonable amount during the week. Including relaunching C&R. (Sorry. I'm still dying of happiness over it. If you haven't already, go submit something.) It felt like, despite the lovely, cool weather we were having, this would be another weekend that didn't quite feel autumnal enough for me. I worried that I would miss the entire season. Sunday was a different story. 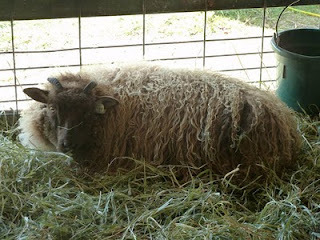 On Sunday, I went with my family to Rhinebeck for the NYS Sheep and Wool Festival. I've been to the Dutchess County Fairgrounds plenty of times, and I've never seen it as busy as it was on Sunday, or been so happy to spend an entire day there. 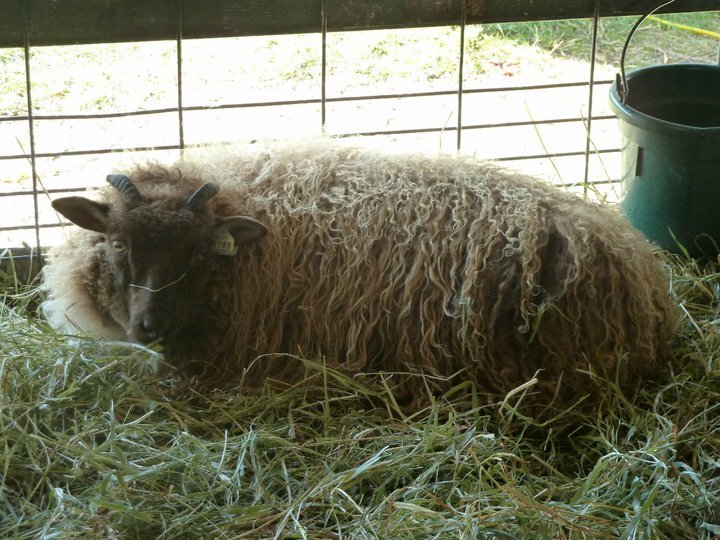 Every building was filled with animals, fiber, and some of the most beautiful yarn I've ever seen or touched. I purchased some lovely skeins to make a shawl and socks for my mother, a hat for Jillian, and enough for a shawl and mittens for myself! I also bought a ton of different roving, some to try felting, and some to practice more spinning (and maybe dyeing!). I'm definitely still in need of some major practice, so I can't offer any advice on how to get started, but my friend and fellow Oxonian, Christina, makes some beautiful yarn, and is sharing some of her adventures in fiber on her new blog, SoGentlyBefore, so that might be a good place to look around. Better even than the barns filled with yarn, though, was the festival filled with people. My sister pointed out while we were still in the parking lot that everyone dressed like me, which wasn't entirely true, but when I overheard someone describe a lost person as "He has a beard and he's wearing a vest," it was pretty hilarious how many people did share a certain aesthetic. And it wasn't just youngish hippish knitter-bloggers. There we lots of families, older people, and, I was pleased to see, quite a few male spinners and knitters. I don't know what it was that made me feel so happy and warm there, but it was wonderful. Everything about it felt homey and like a little extension of the communities I've built for myself. I'd love to feel that way at least a little bit more everyday. And I do, in many ways. Each year seems to build on the others in fascinating and wonderful ways. by Call & Response, a new 'zine Carlea Holl-Jensen and I started this week. and especially, to share some of your creative work on C&R. This World of Wonder comes, after much delay, from a word-of-the-day sent to me by the lovely Carlea, and in honor of my very tentative plans to apply to graduate school. The phrase Ivory Tower comes from the Song of Solomon (7:4), and doesn't have much to do with our current idea of it as that isolated world of intellectual pursuits completely detached from reality or practicality. To be part of the problem of the Ivory Tower, I'll tell you that the first use of the phrase as we now understand it was in Charles Augustin Sainte-Beuve's poem "Pensées d’Août, à M. Villemain." I know it's usually meant in a pejorative way, but given my affection for academia (though I'm not in school right now, I work with textbooks and spend a lot of time talking to professors and thinking about pedagogy) and the fact that my alma mater is once again the most expensive school in the country, clearly I have some love for the Ivory Tower. In my mind, the Ivory Tower isn't about meaningless research and shelter from responsibility. Instead, it's about finding meaning in the preservation of something fleeting and undervalued, intellect. It's about settling into a beautiful room with a good book and not worrying about what else you have to do that day. It's about conversing with interesting and passionate people, sharing ideas and inspiration. It's about giving yourself the freedom to think on the level you want to think on, and not on the level everyone expects. This Friday evening was spent at happy hour with some colleagues (one of whom was recently featured in New York Magazine's Look Book), followed by dinner with one of my closest friends from college at Menchanko-Tei, which was actually quite good and fairly affordable (especially considering we split a bottle of wine). Saturday was mostly a resting day, running errands, knitting, and generally crossing things off my omnipresent to-do list until that evening, when I met up with Roger for a pig roast at the Peekskill Hat Factory. We saw the studios of our friends Jo-Ann and Chris, and watched a man juggle fire before taking a quick stroll around the exhibit they'd set up, which featured a few interesting drawings of bones, a curvy wood lamp, and some really lovely pottery. And the pork was quite good also. On Sunday, Cece, Roger and I picked up our friend Rob at the train station and made our way to Bear Mountain, where they are having Oktoberfest each weekend until the end of October. We had a very nice time (despite not climbing the mountain), and enjoyed the food and beer (Rob and Roger each had three liters of it in their newly acquired be er steins), but I don't think I'd recommend it unless you were planning to go hiking or do something else at the same time, or just really, really love beer and sausage. I'd expected there to be more traditional German music (the band played "America the Beautiful" not once, but twice while we were there) and crafts (think a tag sale of junk for eight-year-olds), and was a little disappointed on that end. Still, it was nice to see Rob, who is living in the city and getting his PhD at Columbia, and to be outside in the beautiful weather. We followed it up with more eating and drinking, this time at a sushi place and the Peekskill Brewery. Overall, I'd say any weekend that involves that much sushi has to be considered a success.